1. The initial parameter vector is determined, e.g. p(1) and the corresponding function value f(1). 2. A search direction r(1) and a stepsize s(1) are determined. 3. Perform a new simulation run to find the parameter vector p(2) = p(1) + s(1)*r(1). 5. When the f(2) is smaller than f(1) and the difference between the two is smaller than a given tolerance, stop the process. The optimum has been found. 7. Otherwise a new stepsize and/or a new search direction are determined and the process is proceeded at step 3. The choice of the stepsize is of importance for the speed an accuracy of the search process. A small stepsize will make the optimization process last very long. A large stepsize will make it less accurate. Most methods will therefore use a variable stepsize. Of equal importance is the proper choice of the search direction. Methods for finding the search direction, can be divided in two groups: direct search methods and gradient search methods. The gradient of a function, is its slope at a certain point. Gradient search methods use this slope to find the optimal direction of search. The optimization methods that are supported in 20-sim will now be explained. The pictures at the right visualize the methods with two varying parameters x (horizontal) and y (horizontal) and the corresponding result (vertical). The perpendicular search method uses a search direction that is always perpendicular to the parameter axis. This means that only one parameter at a time is varied. All other parameters keep the same value. After one step, a next parameter is taken and the process continues. 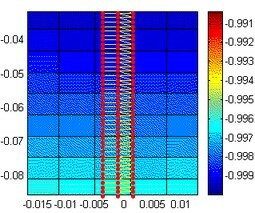 The line climber method uses a search direction that is always perpendicular to the parameter axis. This means that only one parameter at a time is varied. All other parameters keep the same value. After a minimum has been found the next parameter is varied and the process continues. The steepest descent method starts its search in the direction of the steepest slope. This direction is kept for each new step until a minimum has been found. Then a new search direction is determined and the process continues. The continuous descent method starts its search in the direction of the steepest slope. After each new step a new search direction is determined and the process continues. The Newton Raphson method not only uses the gradient of a function, but also the second order gradient to determine the search direction. This direction is kept for each new step until a minimum has been found. Then a new search direction is determined and the process continues. Note: The method only converges for a positive second order gradient, i.e. near the minimum. This is shown in the figure to the right. For x = -0.7 and y = -0.9 the method does not converge. For x = -0.5 and y = -0.3 the method does converge. The Polack Ribiere method not only uses the gradient of a function, but also the second order gradient to determine the search direction. The second order gradient is estimated based on previous search directions. The search direction is kept for each new step until a minimum has been found. Then a new search direction is determined and the process continues. The Broydon Fletcher Goldfarb Shanno method not only uses the gradient of a function, but also the second order gradient to determine the search direction. The second order gradient is estimated based on previous search directions. The search direction is kept for each new step until a minimum has been found. Then a new search direction is determined and the process continues. 1. Gradient search methods (3 to 8), need more steps (note that each step means a simulation run) to determine the gradient. The Newton Raphson methods needs the most steps, because this method also needs additional steps for the determination of the second order gradient. Users are therefore advised to use methods 1 and 2 only for optimizations with one parameter, and use the methods 7 and 8 for optimizations with more parameters. Use the other methods for checking the results or educational purposes. Bazaraa, M.S., Sherali, H.D., Shetty C.M. (1990), Nonlinear Programming, Theory and Algorithms, John Wiley & Sons Inc. New York, ISBN 0-471-59973-5.